Apple’s deal to put iTunes content on Samsung TVs is a shock as the two are fierce rivals. However, it shows pragmatism is winning out over Apple’s proprietary instincts. It must have been incredibly uncomfortable for Apple to seek a deal with Samsung. However, with its hardware business slowing, Apple needs its service business – led by iTunes – to pick up the slack. Moreover, Samsung can help Apple a lot with this. Back in Q2 2013, iTunes was the biggest online store for renting movies. It had a 6.4% share of the rental market versus Amazon’s 5.8%. Redbox Kiosks led the market with 12.4%. Fast-forward to 2017 and Amazon has become the dominant online movie store. 17.9% of rentals occurred through Amazon and only 7.9% through iTunes. Redbox had fallen to 12.5%. Job number one for Apple is to reverse the decline in iTunes. To do it, it must fix its biggest handicap: poor reach to the television screen. Unfortunately, Apple TV has not helped nearly enough. To be sure, Apple has a huge share of the mobile phone market. 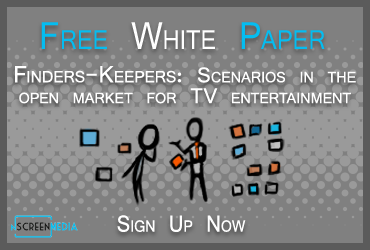 However, the preferred place to watch movies and TV shows is, of course, the television screen. That is why Apple created the Apple TV. Unfortunately, the device has not done as well as the competition, at least in North America. 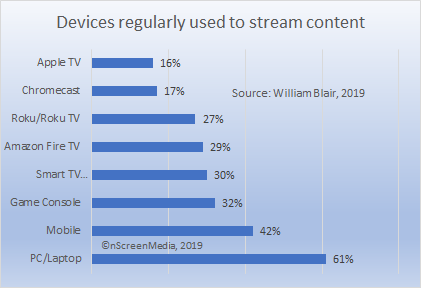 According to a 2018 William Blair U.S. survey, 29% said they used an Amazon Fire TV or Stick, 27% used a Roku or Roku TV, 17% used Google’s Chromecast, and 16% used Apple TV. While some people are comfortable searching for a movie on their phone and casting it to their TV, most prefer to search on the intended viewing screen. Apple’s resistance to supporting other devices with its services has cost it big in the premium video arena. Unlike Apple, Amazon has worked hard to get Prime Video on most connected TV devices. It is already available on Samsung TVs, and users can rent and buy movies through the app. Prime Video even became available on Apple TV at the end of 2017. The only major connected TV it is not available on is Google’s Chromecast. The strategy has worked for Amazon, allowing it to almost quadruple it’s video rental market share while Apple has only made incremental gains. The stakes are getting much higher for Apple in premium video. The company invested close to a billion dollars creating content in 2018. Some are forecasting the company will quadruple the investment by 2022. Apple also hired top TV executives from Sony responsible for hits like Breaking Bad and Shark Tank. If Apple is to maximize investment in content as many people as possible must be able to see it. Perhaps another thing the Apple-Samsung deal does is finally silence the persistent rumors that Apple is going to release a television set. Were that the case, it would have reserved iTunes for the iOS family of products. Expect similar announcements with other manufacturers like LG and Vizio in the next several months.